It’s No Country For Old Men meets Heat in this pretty cool crime movie that showcases both the bank robbers and the police detectives who are pursuing them. This movie perfectly combines a bank robber- police detective story with the feel and atmosphere of a western. 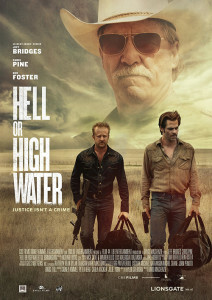 While the subgenre might seem familiar on the surface level, Hell or High Water takes that general premise about two guys robbbng banks and the law enforcement that’s after them, and it runs with it. The movie becomes an opportunity to explore the modern west, including the transformation in land from an interest and focus on farms to digging for oil. Add that to the Rich characters, lively performances, creative dialogue, and super entertaining story, and you’ve got one of the best movies of the year. Hell or High Water is one of those movies that takes a big risk and ends up coming out super strong. It’s a movie that really does hit the sweet spot of both smart, artistic, and entertaining. The risk is that it’s a movie that plays in some very familiar territory. Two bank robbers and the police detectives who are hunting them down. That’s the surface level initial idea. We’ve seen this kind of movie before, (Heat, The Town,) only here, set in Texas and given some personal touches, this movie feels more real and interesting than most. This is the kind of film that takes its time to get everything exactly right. The movie is filled with deep and even poetic conversations. The dialogue scenes are mostly pretty brief, but they are all really well-written. And they move in such a way that each one reveals more to us about the characters. Here we have some top notch actors placed right into the kinds of roles they do best. Jeff Bridges is the aging Texas sheriff, nearing retirement, (just like Tommy Lee Jones in No Country For Old Men.) Chris Pine is the smart, but desperate brother. And Ben Foster is the loose cannon. The movie opens with the first bsnk robbery. It’s a quiet Texas morning and the street is deserted. There’s only one car circling a bank and it’s our two brothers pulling up just as the teller arrives to open the doors. We see them follow the teller in, holding her at gunpoint, and then wait around together for the manager to show up, who has the keys to the drawers. And during that short exchange, we already get the idea that Tanner (Foster,) is the hot-headed impulsive one, wheras Toby (Pine,) is the smarter and more reserved of the two of them. Now it’s onto the sheriff. Marcus Hamilton (Bridges,) isn’t expecting this kind of case to fall in his lap the way it does. In fact, when he first hears about it he asks if the FBI is just looking for an assist. Turns out the FBI isn’t interested in the case at all. That’s because the brothers are only taking a small amount of bills from each bank. Instead of hitting up one or two bacons for lots of money, these guys are hitting up a bunch of banks for just a little bit of money at each. And by doing that, thru stay off the radar of the FBI. So Sheriff Marcus has to take on the case and he does this by trying to out-maneuver the brothers, along with his Native American partner. As we get past the initial robberies and police pursuit scenes, we start to learn a little bit more about the characters. Specifically the two brothers. Toby has got an ex-wife and two sons who he almost never sees. He hasn’t paid any child support in ages and that’s what’s keeping him back from seeing the boys. His mother just passed away and the hospital bills are what ate up all of his money. His brother, Tanner, meanwhile, has been in prison for years, for murdering their abusive father, and now has just gotten out. The situation with Toby and the robberies is that the bank is trying to close on his family farm and take it away. Toby wants the farm as something he can give to his sons. And there’s a hell of a lot of oil sitting underneath the land. Which means if he can just keep the farm long enough for an oil company to start digging on the land, he will be rich. Only the bank is closing on the property in the next few days and that is what has made Toby so desperate, pushing him over the edge to start doing the robberies. As we follow Toby and Tanner and learn about their history together, and what brought them to the point they’re at now, we also follow Sheriff Marcus and his partner. These guys are smart, but they’re also pretty funny. They constantly trade insults with each other, and Marcus, in particular, is both culturally and racially insensitive in the way an old man, who never learned how to clean up his act and get politically correct, might be. Marcus and his partner, Alberto, both have interesting theories. For Alberto, the theories are about the land. He talks about how it was once all Native American land, the land of his ancestors. And then it passed over to the land of the white man. The cowboys land, or that of Marcus’ ancestors. And now, it’s the banks land. They’re taking it away from the white man the same way that the white man took it from the Native Americans. And in hearing this theory, we get a sort of history lesson of what Texas and the west once was, and what it has become. for Marcus, the theories are much more about the robbers, (although Alberto isn’t far off with his ideas about the banks.) Marcus recognizes that the banks being robbed are all part of the same branch. They’re all Texas Midland Banks. And he tries to figure out where the boys are gonna be hitting next, and stake that location out. What gets really cool is when the two brothers start having the same conversations that Marcus is having with Alberto, analyzing the different banks and what they can get out of robbing each one. 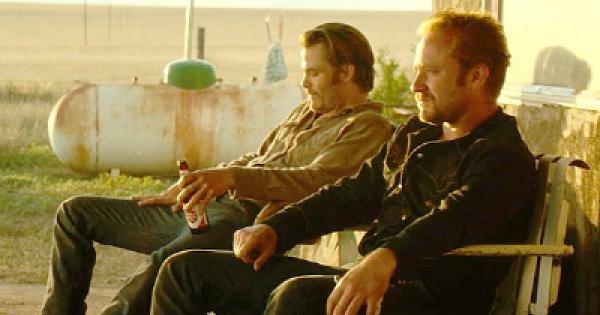 This movie is all about brotherhood and partnership, and it has a pretty compelling story to tell. The amazing landscape cinematography and history lesson of the land are just bonus. It’s the characters and dialogue mixed with the clever take on an old fashioned story, which really make this film so great.